Drake Maverick says tonight’s show will be one of the most combustible episodes in recent memory. Murphy and Nese will take on the Lucha House Party, and Itami will face Ali one on one. Good match. This was fun, and I like that despite all the really good action, the finish leaves it wide open for lots more matches. Drake Maverick asks Mustafa Ali how he’s feeling. Ali says he’s fine, but Drake is worried because Ali has been in the hospital recently. Ali assures Maverick that he’s fine. 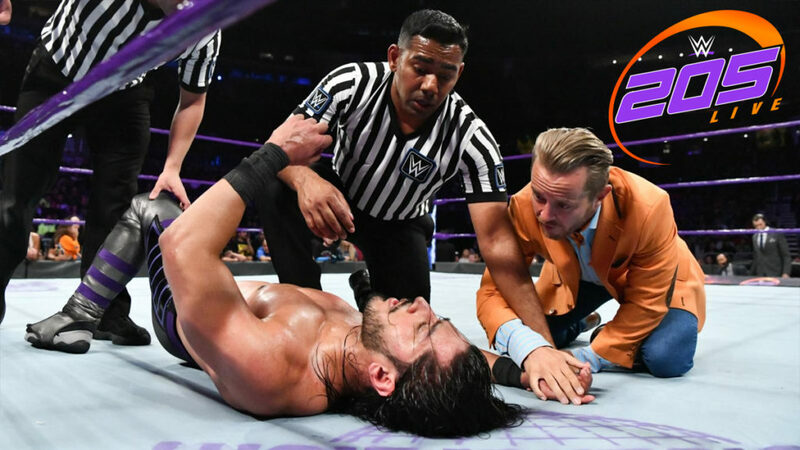 Hideo Itami says Mustafa Ali should have shown him respect. A package video highlighting Noam Dar and his recovery from injury. A pretty good exhibition for Noam Dar. It was nice seeing Sean Maluta get an actual entrance, but he was just there to make Dar look good. He did that well. Cedric Alexander isn’t surprised that Drew Gulak has Jack Gallagher attack him. Alexander says Gulak knows that he can’t beat him. Drew Gulak thinks a match between Gallagher and Alexander is a great idea. Gulak also thinks only he can create a better 205 Live by being champ. Great match. This match was a good example of furthering an injury story without sacrificing any action or going with a less than satisfying finish. Itami and Ali were hitting each other with some very hard strikes and some very big moves. Throughout the match Ali would pause here and there, increasingly showing that something wasn’t okay. Itami was blocking and reversing a lot of Ali’s moves, but that could have been contributed to either Ali being off his game or just that Itami is really good. I think both are accurate for what they put together here. After the match, Mustafa Ali collapses in the ring. The referee calls for help, and Maverick runs down to the ring. Ali is still down on the mat as the episode ends. A strong show with some good story moments. The match itself was great, and the injury story for Ali helped make this match interesting on an additional level.